Besides giving you an easy way to get your car in and out of your garage, good quality and well-maintained doors will also ensure you have no problems with bad weather or wild animals getting into your home. If it's been a while since your door system or seals have been looked at, it's time to call our local team for professional preventative maintenance. We'll check it's all correctly sealed, well-lubricated and properly adjusted. One of the most common problems with sealing is that the weather stripping along the bottom and sides of the door, or along the garage floor itself will age over time and stop working as well as it should. During our maintenance visit, our team will check the condition of your door stripping to see if it needs to be repaired before it stops protecting your garage from water damage. 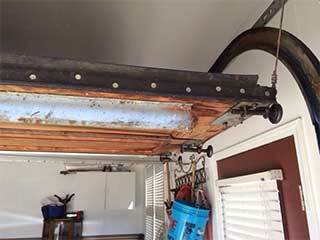 During our routine maintenance visit we will also make sure that the panels of your garage door are in good condition. We will do this by making sure that they fit tightly, do not wiggle, and are not damaged by insects, animals or water. By keeping your panels in good condition, we can help ensure that your property stays dry and protected. Even if your door is sealed and the door is in good condition at the moment, water can sometimes damage the doorframe over time. Weather stripping should keep this from happening -our maintenance technicians will ensure your stripping is doing its job and protecting your door. To book a health check for your system, call us today at Garage Door Repair Staten Island and ask for a maintenance visit – we'll be glad to help!